Gardens may be grounded in place but gardeners are free to rove. Horticulturist Bob Hyland has relocated more than most. Today Bob gardens and designs in and around Portland, Oregon, where he owns and operates Contained Exuberance, a retail storefront featuring stylish containers. Bob is very active with the Hardy Plant Society of Oregon and a member of the Pacific Horticulture Society board. LEF: I’ve heard you describe yourself as an itinerant gardener. Give us a brief overview of the various gardens you’ve created or tended throughout your life. BH: The first gardens that I tended and managed were at Old Salem, a restored Moravian town in Winston-Salem, North Carolina. I planted my first personal garden in Wilmington, Delaware in the 1980s during the time I worked at Longwood Gardens. It was a small backyard behind a rowhouse where I designed and built my first deck and created a mixed border in a naturalistic style. 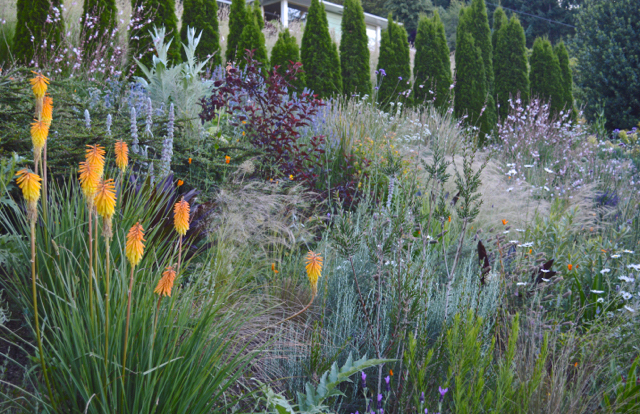 It was the start of the perennial movement and my landscape was filled with lots of grasses and daylilies. I moved to San Francisco in the late 80s to become Director of Education for the Strybing Arboretum Society. That public garden greatly influenced what I did in my very small backyard behind a Marina-style house in the Upper Market Street neighborhood. On weekends I worked at Magic Gardens in Berkeley (no longer in operation) and developed an appetite for Mediterranean climate plants including Dodonea, Grevillea, Arbutus, Ceanothus, Melianthus, and lots of California native perennials, sedges, and grasses. In 2002 my partner Andrew Beckman and I moved to Hudson, New York where we built a nursery from the dirt up. 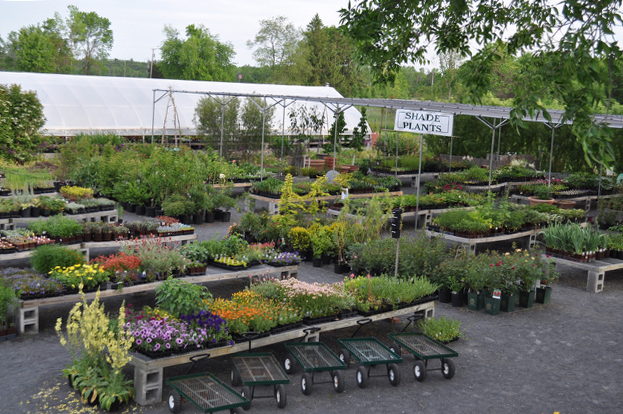 Located 100 miles north of New York City on the east side of the Hudson River in Columbia County, Loomis Creek Nursery was a regional, destination retail nursery specializing in uncommon and connoisseur perennials, shrubs, and annuals. We owned 24 acres of hayed fields, creek, and wetlands. We fenced in an acre to keep out deer we developed and landscaped our nursery. Thirteen years later we’re back on the West Coast. 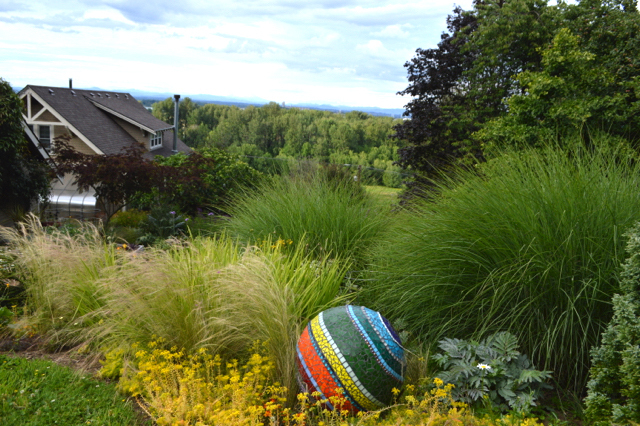 Today we’re in Portland where we have a 5-year-old garden on two thirds of an acre on a Forest Park hillside overlooking the confluence of the Willamette and Columbia Rivers. LEF: That’s a lot of moving! How did each of those very different experiences contribute to how you garden today? BH: With every garden I worked in I gained a greater understanding of plants (and an expanded palette) and a deep appreciation and understanding of the impact of regional climate and how it’s changing. I discovered the benefits and advantages of developing a garden master plan—even if I didn’t always stick to it! I’ve loosened up and learned to go with the flow by allowing plants to re-seed, creep and wander. I relaxed control, backed off on staking, deadheading, and constant grooming. These days I tolerate and understand a drier summer look and dormant lawns. Today I aim for four seasons of interest in the garden (particularly winter!) and capitalize on plants that offer the biggest bang for the buck. LEF: What’s the biggest difference between gardening back east and West Coast gardens? BH: Out here you can make a garden in half the time it takes back east because our benign winters and gradual springs perk along for so long—I love it! I think there’s more of a pioneering spirit in the West, which suits my psyche. I feel it can be difficult to develop a personal style in the Pacific Northwest because we can grow so many plants from all over the globe. This often translates to confused, awkward spaces that are out of sync with their environment. In my garden consulting business I try and help gardeners to focus. LEF: What is your approach to design these days? 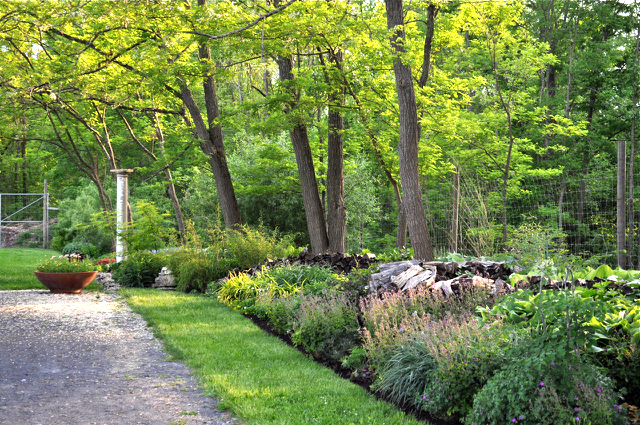 BH: Gardens can truly be four season—in whatever region you garden. Embrace that—easy for me to say now that my winter is much shorter! And work with Mother Nature; she always has the upper hand. Enjoy the ebb and flow. Look beyond flowers; the textural qualities of foliage and bark are equally, if not more, important. My garden is not just about me. I believe we need to embrace and adapt to our changing environment, manage our resources wisely, and consider our relationship with our human neighbors as well as pollinators, migratory birds, soil critters, and mircro-organisms—even those we despise. Then share the love of what you do and why. And I encourage people to develop a personal style, one that is comfortable, easy on the eye, and in tune with the world. One that makes you happy. LEF: In a lifetime of gardening what’s new for you? BH: Recently, Andrew and I have opened our garden to host a series of Chef in My Garden events to benefit Growing Gardens, an organization focused on teaching the skills, benefits, and beauty of growing food, particularly to low-income and prison populations. 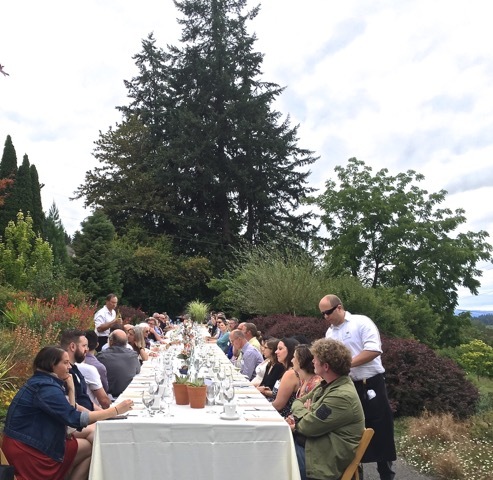 These events offer the chance to support Growing Gardens (see below) while enjoying a delicious meal created by local chefs and farmers, featuring regional and season agriculture. Connections between our physical body (food and drink!) and our senses are portals to gardening for a new generation. I’m very optimistic. Growing Gardens promotes home-scale organic food gardening to improve nutrition, health and self-reliance while enhancing the quality of life and the environment for individuals and communities in Portland, Oregon. For more information visit www.growing-gardens.org.